"How selfish is that?" Why Malcolm Frawley told a preacher to "shut up" on a Sydney train. A week ago, Sydney man Malcolm Frawley was minding his own business – following public transport etiquette – by reading a book on a packed train. When a man boarded the train at Martin Place and began loudly preaching to the packed carriage, Frawley bit his tongue. But not for long. The man introduced himself to his not-so-willing crowd: “Hello Sydney… My name is Phillip Blair, I’m from the United States and I want to talk to you about where you’re going in life,” he said. Commuters on the carriage groaned. Blair claimed their “sins” could be saved by Jesus. “We care more about saving the whales than we care about saving our unborn children,” he said. With that, Frawley – praised online as ‘Book Man’ – stepped in. A shouting match began, captured in a video posted on YouTube. Phillip Blair and &apos;Book Man&apos; Malcolm Lawley face off on a Sydney train. Image via Youtube. When Frawley asked why Blair wouldn&apos;t keep his opinion to himself, he responded "because I care about your soul. I love you." He said the world was "selfish" and we needed to repent. "Who&apos;s the selfish one here mate?" Frawley responded. "Who&apos;s the one who won&apos;t shut up with their opinion? How selfish is that?" To that, his fellow commuters cheered. 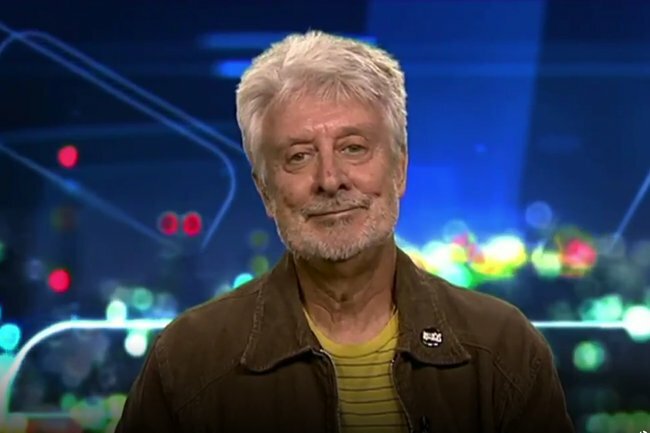 Appearing on The Sunday Project, Frawley said he intervened because he felt Blair was intruding by forcing a public carriage of people to listen to his opinions and beliefs. "For me faith is a personal, perhaps even private, thing so if you and I wanted to sit down over a coffee or a beer and discuss our beliefs that might be fine but I don&apos;t want them inflicted on me in public when I&apos;m trying to read a book," he said. He was particularly angry about Blair preaching about abortion. "I think the trigger for me was hearing his loud voice start to talk about our unborn children, and I wondered whether there was some women in that packed carriage who might not be interested in a conversation about unborn children that was being conducted by a man," he said. Frawley, who teaches acting that religious and secular schools, was asked by The Project co-hosts whether he would&apos;ve reacted differently if Blair was preaching a different religion. In answering, he pointed to last month&apos;s terrorist attack on two Christchurch mosque that killed 50 New Zealand Muslims. 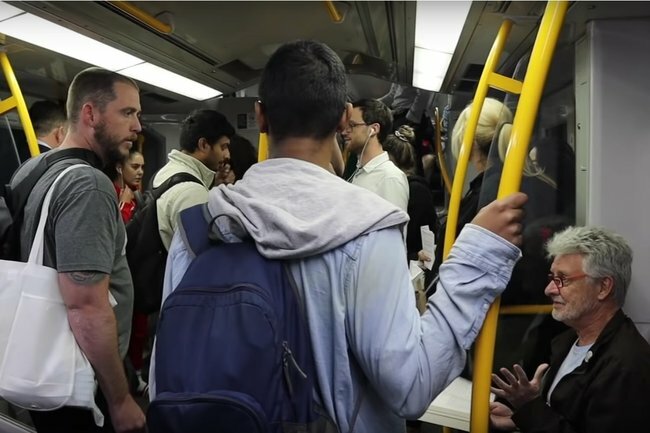 "Look, 50 Muslims were murdered when they were praying in their own mosque a couple of weeks ago, so I&apos;m struggling to see a Muslim preaching the Quran on a packed Sydney train anytime soon." Of course, The Sunday Project co-hosts couldn&apos;t let the interview end without asking Frawley one other very important question: What book was he reading? "Fifty Shades of Grey," Frawley said - which sounds like a lie, but a damn good one.